Do you have a passion for the environment? Can you spare a couple of hours a month to help promote and fulfill the mission of this club? Volunteering as a building focal to encourage higher rates of recycling, distribute news about BEES events, introduce organic coffee, help connect people that could be carpooling, or lead other projects. The Seattle People’s Climate March is this Sunday, September 21 at 1:00 PM, with the rally beginning at Westlake Park. There are some great local events taking place in the Puget Sound region this December. Hope to see you there! December 13. Green Lunches. Smaller gatherings – sign up here, and let’s see if we can get a group in the North end. Sign up link is broken as of 12/5, but will hopefully be fixed soon! 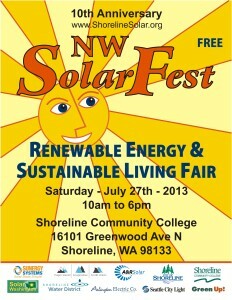 The NW SolarFest is coming! 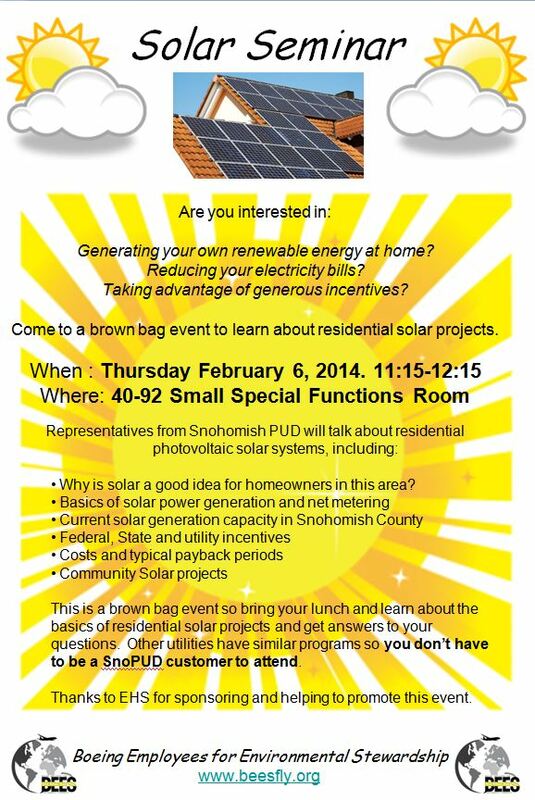 Stop on by to check out fun presentations, learn more about renewable energy and sustainable living, and enjoy demonstrations, live performances, food, and a beer garden! Up to 25 weeks of your choice of fruit and vegetables delivered right to work. Or choose to pick up your produce at one of the many other pickup locations. There are four sizes of box to match you or your family’s appetite and new this year is an option to add fresh pasta and other foods to your order each week. Earth Day is on April 22nd this year, and Boeing is again sponsoring and facilitating many volunteer opportunities. There is still time to sign up for projects this weekend and next weekend. Type GCC or Global Corporate Citizenship into the MyBoeing home page and click on the Volunteering link on the left to see where and when you can help. Join millions of people around the world in drawing attention to climate change by turning off your lights between 8:30 and 9:30 on Saturday March 23. Growing Washington CSA – 2013 Season Sign-Up Is Now Open! It’s finally that time again! The Local Choice Food Box is back for the 2013 season, and we’re better than ever! Sign up now to reserve your spot and grab our 5% early registration discount! Growing Washington and our network of farm partners are eager to offer our customers in King, Snohomish, Whatcom, and Skagit Counties the same great CSA program our members have come to expect, along with some awesome new additions. We are excited to give our members more choices, more box options, more pick-up locations, a new web-store and more great food from our growing family of local farms. So, what’s new this year? We have updated our web-software to make it easier on you, our customers, to be able to choose exactly what share will work for you. We are also expanding our add-on options to King and Snohomish counties, so that those members may now receive weekly additions to their boxes, such as milk, eggs, butter, cheese, sour cream, yogurt, honey, and berry jam. In addition, we will be offering a web-store this year, so that our members will have the ability to purchase additional farm fresh items each week, and have them delivered with your weekly Food Box. Sounds pretty sweet, huh? While some things have changed this season, the foundation of our CSA program is the same: our Local Choice members enjoy the ability to choose every single item that goes into their boxes from a great variety of Washington-based farms, and every dollar goes straight to local growers. And our Farmer Choice members will still continue to receive the best, freshest seasonal veggies that we bring home to our own families. So head on over now and get signed up! If you have any questions, please visit us online, or contact any of our staff at any time. To learn more about where your Food Box dollars are going, please visit the Growing Washington website. As always, we look forward to growing your food! Register by April 1 to receive a 5% discount off of your purchase! And don’t forget! If you refer a friend, you’ll receive an additional 5% discount off of your season’s worth of farm-fresh food. Growing Washington is a 501(c)3 non-profit farming organization. Alm Hill Gardens, at the winter Farmer’s Markets! From OnlineEducation.net, a piece on recycling plastic.